Thermomass and Ram Construction partnered to develop a comprehensive building envelope plan for the ground-breaking facility. Ram Construction, headquartered in Delta, British Columbia, is nearing completion of what is thought to be the first integrally insulated tilt-up freezer project in western Canada. 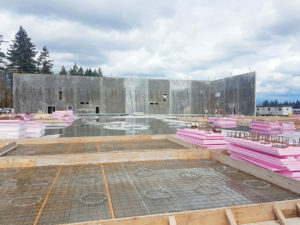 The project, Subzero Cold Logistics, will be the newest building in the 1,900-acre Campbell Heights Business Park in Surrey, British Columbia. Coincidentally, Ram Construction constructed the very first facility in Campbell Heights in 2004. Tilt-up construction has long been a trusted building method in western Canada, and recent energy code updates have further solidified sandwich wall building envelopes as an ideal option for owners looking for enhanced energy-efficiency, durability, and moisture control. Until this project, however, controlled temperature warehouses were still commonly built using only insulated metal panels (IMPs) or tilt-up walls with post-applied IMPs. Thermomass and Ram Construction partnered on a proposal for the project’s owner, Todd Ko, president of Radius Transport, to show how insulated tilt-up walls could maintain the planned set-point temperature of -4 F (-20 C) through continuous, edge-to-edge assembly using Thermomass System NC insulation and Tigerloc and OHLoc thermal barriers from JK Thermal Solutions. The team also illustrated a wide range of additional structural, thermal, moisture, and maintenance benefits associated with insulated tilt-up construction. After reviewing the provided details and analyses, Ko visited several Thermomass-insulated freezers in the western United States to discuss the benefits of tilt-up sandwich walls with current owners and operators of similar facilities. 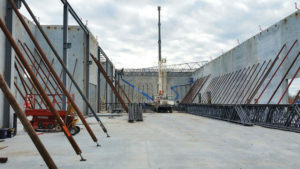 Sold on the energy-efficiency, enhanced durability, and lower maintenance costs of integrally-insulated tilt construction, as well as on the experienced service and support from Ram Construction and Thermomass, Ko was eager to proceed on the new building and the new-to-the-area building method.